Looking for a whole bunch of electronics to blow last Friday’s paycheck on? We’ve got you covered, thanks to a 2-day sale over at Groupon. By using coupon code “SALE3” at checkout, you can save 10% on your orders, up to $50 off. After cruising through their pages and pages of deals, we actually found a handful that are worth considering. Items like the official Samsung Galaxy S6 wireless charger can be had for $35 (normally $50). The 1st gen Moto X on Verizon is also as cheap as $180 after the discount. But maybe the best deal of all, if you are in the market for home Hi-Fi speakers, is the discount on Sonos’ entire line-up. You can grab a Sonos Play:5 for just $342 (usually $399) or the Play:1 for $171 (usually $199). 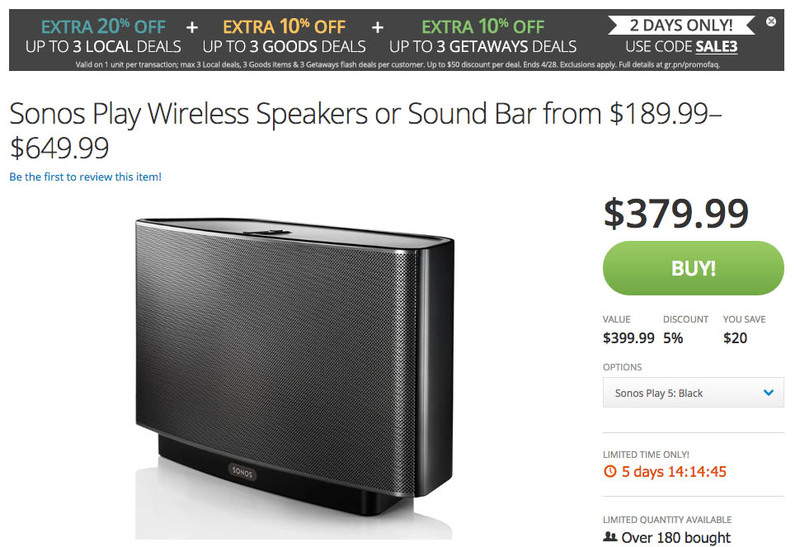 Sonos products are almost never discounted, and if they are, never to these levels. There are other deals as well, all quick-linked below. Again use code “SALE3” at checkout.